Invesco Field at Mile High, at 1701 Mile High Stadium Circle West, opened on September 10, 2001 as the home of the Denver Broncos of the National Football League, replacing the old Mile High Stadium. Designed by the architectural firm HNTB Corporation, formerly Howard, Needles, Tammen & Bergendoff, the stadium has a capacity of 76,125 for football. It has also served as home to the city’s Major League Lacrosse team, the Denver Outlawas, Major League Soccer franchise, the Colorado Rapids, and the rivalry game between the Colorado State University Rams and the University of Colorado at Boulder Buffaloes. 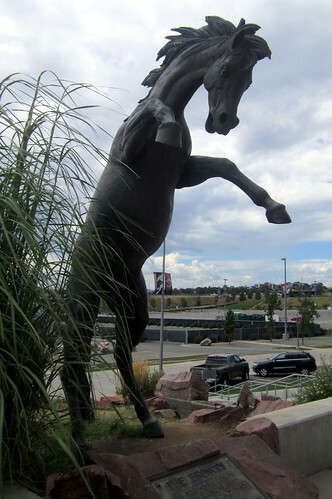 The Broncos, a sculptural group of 1½ times life size horses running uphill in an alpine mountain setting, is located on the south side of Invesco Field. The statue, a gift to the people of Colorado from Mr. Pat Bowlen and the Bowlen family, was designed by sculptor Sergio Benvenuti. It features seven horses–five broncos, one mare, and one colt–and a water feature, which resembling a raging stream, that pumps 850 gallons per minute and is slightly heated so that in the winter, steam will rise from the stream as it does in nature. This entry was posted in Denver Broncos and tagged Broncos, Denver, Field, High, Invesco, Mile, Valley. Bookmark the permalink.